This letter, intended to be customized in Microsoft Word, is to be used when seeking a payment plan for medical bills. 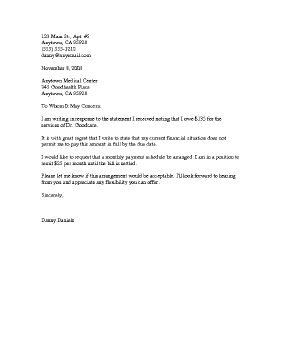 I am writing in response to the statement I received noting that I owe $135 for the services of Dr. Goodcare. It is with great regret that I write to state that my current financial situation does not permit me to pay this amount in full by the due date. I would like to request that a monthly payment schedule be arranged. I am in a position to remit $25 per month until the bill is settled. Please let me know if this arrangement would be acceptable. I'll look forward to hearing from you and appreciate any flexibility you can offer.